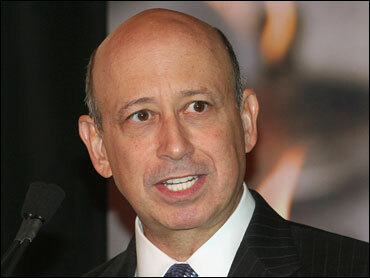 Goldman Sachs Group Inc. CEO Lloyd Blankfein is getting a $9 million stock bonus for 2009. The bank said in a securities filing Friday that Blankfein will receive more than 58,000 shares of restricted stock that can't be cashed in for five years. Blankfein will receive no cash as part of his bonus. News of Blanfein's bonus was eagerly awaited by Wall Street, and also reflects its changing pay culture. Several banks are paying their CEO restricted stock and adopting clawback provisions in response to a furor over outsized cash bonuses paid by financial institutions that helped push the economy into a recession and then later took billions in federal bailouts. JPMorgan Chase said Friday that CEO Jamie Dimon received a $16 million stock bonus, making him the highest paid CEO among the nation's largest banks that have announced their pay plans. Morgan Stanley CEO James P. Gorman received a stock bonus valued at $8.1 million for 2009. Gorman was co-president of the bank for that period. He replaced John Mack as CEO last month. Mack, who remains chairman, received no bonus for 2009 or the previous two years. Goldman and JPMorgan have emerged from the financial crisis as two of the nation's strongest banks, earning billions in profits while rivals including Citigroup Inc. and Bank of America Corp. have suffered losses. Still, neither JPMorgan nor Goldman have escaped scrutiny over employee pay packages. Blankfein's bonus was less than some had expected. He led Goldman to stellar earnings in 2009 on strong trading of risky assets, including a record $4.79 billion profit in the last three months of the year. But Goldman bolstered its fourth-quarter profits by slashing the size of its bonus pool in a move aimed at quashing criticism of outsized paydays at elite New York investment banks. Blankfein received compensation valued at $42.9 million during fiscal 2008, virtually all of it coming from stock and options awarded for his previous year's performance. He got no performance-based pay for his work in fiscal 2008, when Goldman reported its first quarterly loss since becoming a public company and its stock fell more than 60 percent amid the deepening credit crisis.